Miami is an amazing city since it stands out culturally and geographically. The Hispanic influence was everywhere to be seen, especially in places such as Little Havana. The humid weather and beaming sun also made it clear why it's called the sunshine state. All in all, Miami is a city that offers amazing food, breathtaking art and stunning beaches. They're a bunch of activities to do, which means you'll never get bored. With that being said, make sure to book a flight to Miami, you won't regret it. Due to the hot weather, I had to carefully craft my outfits in order for them to be breathable, but also summery and fun. Before leaving, I laid out some of the clothing pieces I was eager to wear together. This made it easy for me to just throw on my outfits in the morning and avoid taking two hours to get dressed (never takes me that long, but you get what I'm saying). Even though we stayed at the beach quite often, we still made sure to explore Miami and visit the city. This is what I wore as a tourist in Miami. This picture was taken in a parking lot. We were visiting Bayside Market when right before leaving, I spotted with my sharp eye this peach colored wall in the parking lot and decided to drag my brother there. The shorts I'm wearing are thrifted and my vintage looking blouse is from Simons ( bought it ages ago, but here's a similar one). Quick tip: tying a blouse or any button up top in the front completely transforms any outfit and makes it look like you put a decent amount of effort in your attire. My sunglasses as well as my purse are from Urban Outfitters. One of the most memorable nights during the whole trip was when we celebrated my mom's birthday. We ate dinner at La Mar by Gaston Acurio, which is a Peruvian/fusion restaurant located in downtown Miami. Not only was the food delicious, but the view was jaw dropping. We were overlooking the water as well as the buildings while the sun slowly set. It was amazing. Since it was a Boujee restaurant, I wanted to look somewhat put together. The dress I wore was from Forever 21. Yes, you read that correctly, FOREVER 21. This burgundy wrap dress is extremely flattering, even when you've had to much to eat (#me). My heels are the Sam Edelman's that I wore to prom (check out my prom blog post here) and the jewelry I'm wearing is from Peru. Lastly, I wore a burgundy lip pencil from Nars to tie the look together. The minute we arrived at our Air bnb, I knew I had a cute little instagram waiting for me with these palms. You would think that I would take advantage and immediately take the pic, well you're wrong. This picture was taken on our last day, literally seconds before my car left for Key West. At least I got the picture, right? This outfit was worn several times throughout the trip since it was very comfy. These stretchy shorts are from Simons and my cinched top is from Lululemon. The shoes are from Fila and are the comfiest sneakers EVA. Just look at how the sun beams off them. 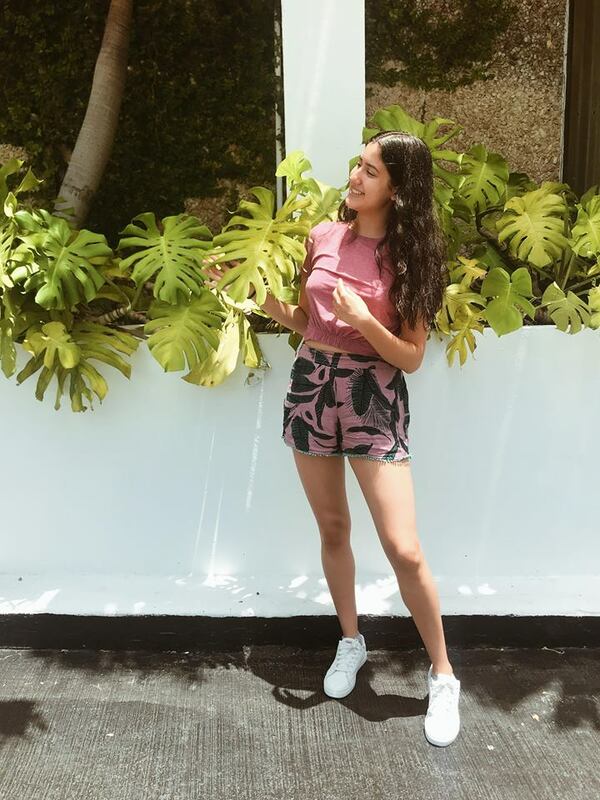 *P.S : I was kinda shook when I realized my shorts matched the palms. Visiting the Wynwood Walls was another highlight from our trip. The artistry behind all of the murals was outstanding. I love how this elephants tusks randomly morph into tentacles. That is pure AWESOMNESS. This mural also unintentionally match my outfit color scheme. Everywhere you turned you could see people posing in front of these works of art. You could even catch a glimpse of my parents taking selfies in front of them. What I wore for this occasion were my colorful culottes from Zara and my thrifted tank. The random strap across my chest is my purse, if you were wondering. Lastly, I obviously wore my Birkenstocks because... well they're amazing. My sunnies are from Urban Outfitters. Last, but certainly not least, we have what I wore when visiting the Hemingway house in Key West. The colonial styled house was really impressive inside and out. However, I must say that the fifty somewhat cats living there made my day. Everywhere you looked you could either spot a cat sleeping, playing or simply walking around. It was heaven for any cat lover (a.k.a me). What's even more astonishing is that they all had SIX TOES!!! Believe me, I checked. Long story short, Hemingway had a cat named Snowball who happened to have six toes and all these other cats currently living there are descendants from Snowball. Groundbraking, I know. Moving on to outfit details. My levis shorts are from Urban Outfitters and my tank is, you guessed it, thrifted. My shoes are Filas and sunglasses are from Urban. With so much to see and do, Miami was a city to remember. You can find most of these outfits already posted up on my Instagram (@marianacarpioo). Where is your dream vacation? Let me know! Don't forget to share and comment if you enjoyed!